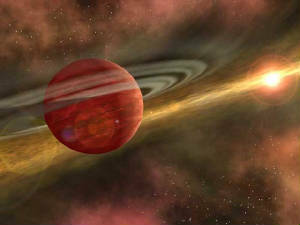 Like Jupiter, Saturn is about 75% hydrogen and 25% helium with traces of water, methane, ammonia and "rock", similar to the composition of the primordial Solar Nebula from which the solar system was formed. Saturn's interior is similar to Jupiter's consisting of a rocky core, a liquid metallic hydrogen layer and a molecular hydrogen layer. Traces of various ices are also present. Saturn's interior is hot it is 12000 K at the core and Saturn radiates more energy into space than it receives from the Sun. Most of the extra energy is generated by the kevin-helmholtz mechanicism as in Jupiter. But this may not be sufficient to explain Saturn's luminosity; some additional mechanism may be at work, perhaps the "raining out" of helium deep in Saturn's interior.